Inside The Monument, built to commemorate the Great Fire of London, in the City of London. For more on the history of The Monument. PICTURE: Flickr/CC BY 2.0. 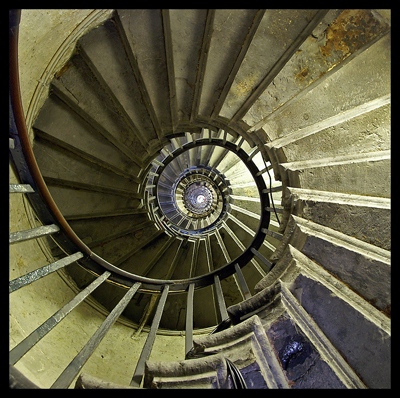 I was trying to think of a specific spiral staircase that was mathematically clever as well as attractive to look at, perhaps in Hungary or Czech Republic. But in the meantime I offer you the Vatican Museum.